A stellar line up of seasoned jazz players. Their past performances at the Black Dog have been crowd pleasing events, so this Brunch time should be a real treat! 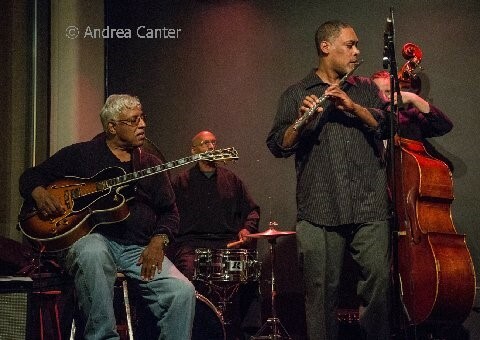 The Jazz Bridge Project features the father-son team of guitarist Roger and flautist Rajiah Johnson, along with Weather Report alum Eric Kamau Gravatt on drums, Ron Evaniuk on bass and Javi Santiago on Keys. A native of Upstate New York, guitarist Roger Johnson grew up hearing the great organists like Jack McDuff and Jimmy McGriff. Despite the great players of the era–Grant Green, Kenney Burrell, Pat Martino, and West Montgomery–Roger was heavily influenced by John Coltrane and the 1960’s modal players. He notes that “Joe Ford (McCoy Tyner, Fort Apache) is my true friend, teacher, critic and a hero to me in all things.” Coming up in the clubs of Buffalo and Rochester, Roger sat in “with almost every Jazz musician that came through, from Monk, Roland Kirk, Adderly and every organ group that came through.” Son Rajiah Johnson (flute) has played with the late Jack McDuff and recorded with hip-hop band Atmosphere and Keston and Westdal, among others. Also a woodwind repair technician, Rajiah studied at the University of Connecticut, Concordia and Minnesota State Technical College. Leader of his own quartet, Ron Evaniuk recorded with Twin Cities trumpet legend Gene Adams and played with George Avaloz, in addition to his long-standing work with Eric Gravatt’s Source Code and occasional work with the JazzMN Orchestra. He’s recently appeared with drummer/pianist Rodney Ruckus. An alum of Weather Report and the bands of McCoy Tyner, Joe Henderson, Freddie Hubbard, Blue Mitchell and others, drummer Eric Kamau Gravatt essentially has had two careers in jazz with a couple decades of separation. Like John Coltrane and long-time associate McCoy Tyner, he is a native of Philadelphia. Originally a conga player, Gravatt taught percussion and music in Philadelphia and Washington, DC in the 1960s. Miles Davis invited him to join his band, but Gravatt turned down the Prince of Darkness to follow Wayne Shorter into Weather Report, with whom he toured and recorded. He moved on to the fusion band Natural Life (with Bobby Peterson and Bob Rockwell), bringing him to the Twin Cities some 30 years ago. Demands of family and a desire for financial stability took Gravatt out of fulltime music and into fulltime work as a guard at the Minnesota Correctional Facility in Lino Lakes. Only after retiring from Lino Lakes did Gravatt return to his calling, touring again with McCoy Tyner, performing with his band, Source Code, and recently engaging in more experimental improvisations with Adam Linz, Brandon Wozniak, and Dean Magraw, with whom he recently released the duo CD, Fire on the Nile.